We have re-engineered our cells from the ground up, starting with the base of the unit which uses slot-and-tab construction to provide a ridged foundation. This minimizes resonance, which enables the Fusion Arc cell to take advantage of the new FD’s unmatched speeds. Capital Robotics offers a selection of pre-configured Cells that are engineered as a compete solution for a host of applications. Fusion Arc designates our family of cells available in a range of sizes and configurations, these pre-engineered systems provide a fully enclosed environment that remains functional, flexible and meets most safety requirements while remaining very cost-effective. Each cell is available with a host of productivity options and the space-saving design make for easy placement and relocation in your manufacturing area. Another unique feature of our Fusion Arc Cells is it comes fully assembled, saving valuable set-up time. As an option, Capital Robotics can provide our Matrix-Tooling Tabletop/ The hole pattern can be labeled with letters and numbers, further defining fixture placement. This feature greatly reduces fixture set-up time and allows for easy changes in the future. Tabletops are designed to last a lifetime and can be reversed if surface becomes damaged. The new modular construction enables us to integrate additional peripheral axis or stations, adapting to the customers needs as required. 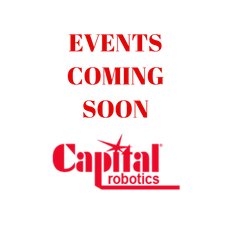 After years of implementing automated welding, Capital Robotics has acknowledged our extensive customer base. Listening to our customers, Capital Robotics has redesigned our Fusion Arc Cells, utilizing fresh, new integration techniques. Compact design allows for ease of loading/unload on the same side. Less investment when compared to a turnable. Dual station with larger openings. Modular design allows changes to be made after purchase. Dual station cell with larger openings than the FA100. Same facet load/unloading.